Traditionally, the closest sandboarding location is Ica, which is about 4 hours from Lima. 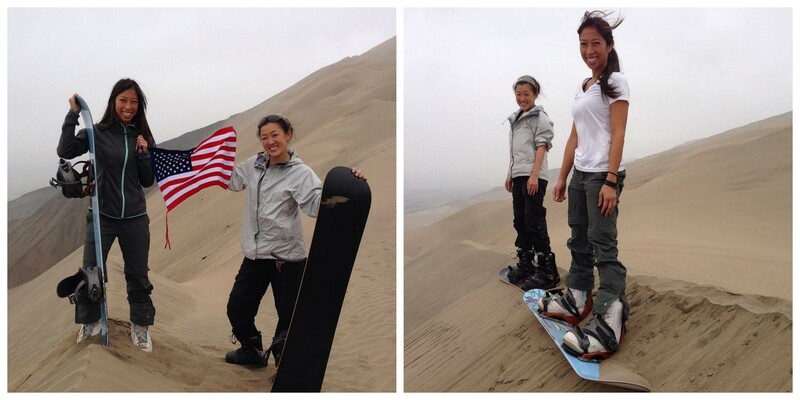 However, with a bit of luck, a new area much closer to Lima now offers sandboarding as well. We found Sandride Sandboarding Lima online and booked for a day trip. Annie’s “I hate motion sickness” face! It took about an hour and a half to reach San Bartolo, where the desert sand dunes are. Our guide/instructor, Rafael, was very cautious and familiar with the dunes as there were no visible routes. The ride to the hill was an adventure in itself, it felt like ATV! Then we arrived at the first hill and I began to doubt if this was all a big mistake…the hill looks like a black diamond! First hill…funny thing about sand, it doesn’t slide like snow, one must really put some hips into it. Rafael had all the confidence in us and somehow made us (me) believe that I won’t break a bone. With eyes half closed (sand also doesn’t melt like snow…bummer! ), I tipped the board over and dived in. And I was stuck. I look over and Annie was stuck. It was as if we were boarding on a flat path on snow! With the new found knowledge, we proceeded to the second hill which rides up and down like waves. Annie already got the hang of it and breezes down with zero effort. I had a tougher time getting to the finish line but Rafael, still confident, thinks we can take on the biggest hill there. On the way he told us he had a surprise for us and I was picturing a cactus filled sand mine we’re supposed to navigate… Then at the top of the hill he pulls out a USA flag instead. Whew! How thoughtful! Biggest sand hill, no turning back! The large sand dune was AWESOME. It was steep as a double black diamond but now that we got the hang of it, it glides more like a blue. The hill was long too so we got to experience the air in our faces instead of sand. Compilation of a day’s work! Rafael said it would take seven days to get all the sand out…I was skeptical but for a whole week I was pulling sand out of my ears!